The Dinner reminds me of a gift-wrapped present that you slowly open for the sake of savoring the impending surprise. That's exactly how I'd describe my experience with this novel. 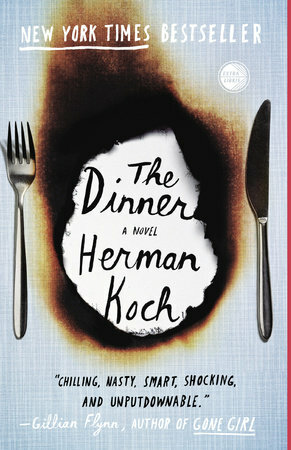 Herman Koch reveals the story little by little to keep you guessing all the way through to the end. The Dinner is separated into several sections that correspond with the meals being served at the actual restaurant. The first portion of the novel is entitled "Aperitif," followed by "Appetizer," followed by "Main Course," and so on. The meat of the story is revealed during the Main Course section as expected, and the story begins to conclude during "Dessert." There's also a lot more going on in The Dinner than just the couples hashing out how they want to deal with their sons. Paul, for instance, reveals how a certain neurological disease from which he suffers might also be affecting his son from a genetic standpoint, and laments about how he feels partly responsible for his son's crime. Paul is the perfect candidate for narrator, since his character is sarcastic and hilarious given his "condition." Paul's frustrations over dealing with his near-famous politician brother are also relatable and quite funny. The violent crime committed by the teen boys involves social media, which I think was clever for Koch to include in the plot. I love the fact that the author portrays social media as dangerous and incriminating, especially since I believe most people in today's society fail to consider the amount of information they're revealing daily about themselves via social media. I hope authors continue to churn out novels that incorporate the danger of using social media in their stories. The Dinner was wholly satisfying and its conclusion was perfect. The author does a great job of challenging just how far people are willing to go to protect those they love the most. If you enjoyed The Dinner by Herman Koch, you might also enjoy the novels featured below.